In a few of my recent posts I mentioned importance of avoiding unrealistic stress in test sessions. – And I also mentioned that there are situations when we indeed want to explore behavior of the application being under stressing load. But first of all, let’s agree on some definitions. With this post, I’ll look into a particular pattern of stress – a “sudden” spike of simultaneous requests to the server, targeting same set of resources or using same API functions. In its simplest form that would be hitting the same web-page. Other common occurrences – login spike, voting spike, and bulk requests. So how can we simulate that? Starting all virtual users exactly at the same time might do the trick for a few rounds, but they will eventually “drift apart” on the timeline. And if your load profile consists of several load scripts, the trick won’t work at all. The virtual users simulating spike must “gather” at the certain point, and then simultaneously fire requests. To achieve that, with NeoLoad, we can actually set a “rendezvous point” . 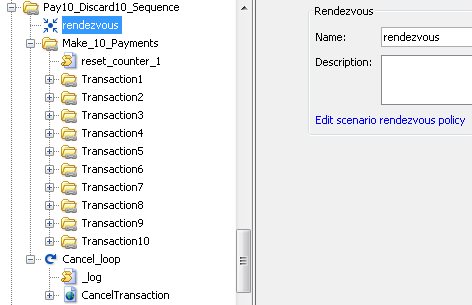 I’m using the same sample script I presented in this post, – a simulation of an online payment, – but with a “rendezvous point” modification. 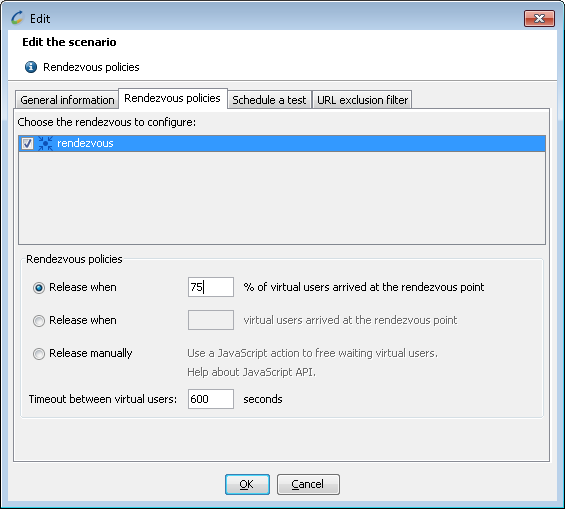 Release settings allow defining density and timing of simultaneous requests. When enough of concurrent users reached the rendezvous point, they are “released” – let go forward and fire the requests. Timeout is needed to avoid endless waiting for the users who “got stuck” somewhere on the way.